Our Little Smart Family: Family is Here! 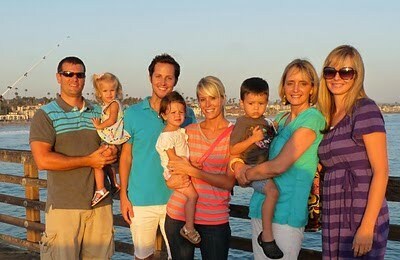 My sis Amy and her family having finally moved to CA! And with that my mom was in town helping. So we go to do lots of fun things while helping them get settled. Checking out "their beach" for the first time. We had a blast minus my sand issues. It was a perfect day to play in the water since it was actually very warm out. After eating Ruby's Diner on the Pier-that was a fun night. Since we will be sticking around here we renewed our zoo passes and The Atherly's bought theirs so this will be a regular thing for us. Good thing because these two are such cute friends. Camryn wants to hold Owen's hand everywhere she goes and luckily he is so patient with her he let's her do it. So cute. The kiddies and my mom. She was so fun to have around for a while-just wish she lived closer now too. The night before my mom left my sis Nikki and her boys came in town to make a pit stop before heading back to Sacramento all together. It worked out great having Owen and Emma up too. Cousins are the greatest. Me and my sissy. So fun to have her and her fam here and to be able to hang out anytime we want! Can't wait for many more days to come just like these ones! We are the ones benefiting from our new closeness!! How long we have waited to be in driving distance to our family. Can't wait to recharge relationships :) Thanks for all the fun times thus far. Can't wait for more!! so fun to have your family close! i do miss that out here. camryn is growing up...such a little toddler now! i love the last pic of you and your sis. both so pretty! How fun! Its always good to have your sis near by. So exciting that you get to live near your Sis. I wish for that! And that picture of the two cousins is so adorable. Looks like you have a lot to look forward to. You guys are going to have way to much fun! Lucky sisters! Looks like the Atherly's got a great welcome to SoCal!